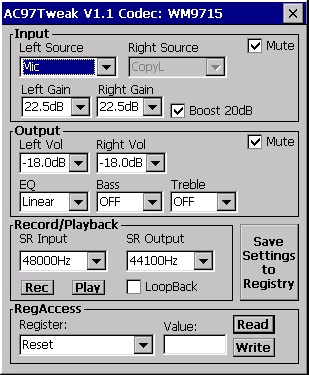 AC97 Tweak can be used to configure some special audio codec features which are not accessible through the common wave API. Known Issue: The Audio Driver mutes the Audio-Out path after each played sound. The AC97 Tweak tool does not reflect this correctly in the Mute checkbox. You can find this tool in the Colibri Software download area.